In fact, five Muslim men who were swept up in the case of the "Blind Sheik" are currently incarcerated in the CMU in Marion. The agent provacateur in the case was F.B.I. 's chief informer in the case, Emad Salem, a former Egyptian Army officer. Salem was also a key witness in the trial of Ramzi Yousef, Abdul Hakim Murad, and Wali Khan Amin Shah, convicted in the World Trade Center Bombing of February 26, 1993. The trial was also notable for the bias shown by Federal Judge Michael B. Mukasey. "This country has experienced militant fascism that failed and militant communism that failed," Judge Mukasey said, adding that "you and the others sentenced today will never be in a position to commit such crimes again." 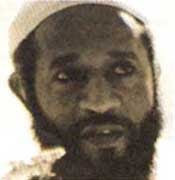 In 1993, Sheikh Omar Abdel Rahman (the “Blind Sheikh”) and ten other co-defendants were charged with conspiracy to bomb New York City landmarks, including two tunnels, the UN, and FBI headquarters (ironically, the landmarks did not include the World Trade Center, although the public often erroneously believes that Abdel Rahman was convicted of plotting to bomb the World Trade Center). There was no doubt that Abdel Rahman was an outspoken critic of the corrupt secular government of Egypt and urged that it be overthrown. But he denied that he inspired terrorism or that he was leading any conspiracy in this country, and there was little evidence involving him in the landmarks case. As described above, "the government paid a million dollars to a former associate of Abdel Rahman’s essentially to frame the Sheikh and his associates." A Jordanian immigrant who came to the United States around 1977. Sentence: 35 years. An American-born Muslim, who was injured when he was a fighter in Afghanistan during the U.S.-backed resistance to the Russian invasion. Sentence: 35 years. From Jersey City. Sentence: 30 years. Convicted of conspiracy; of the murder of Rabbi Meir Kahane, the Zionist militant; of assault on two others at the Kahane shooting site. Sentence: life in prison. Convicted of seditious conspiracy; assault of a Federal agent and city police detective seeking to search his home after the World Trade Center bombing; possession of false identification documents and false passports. An Egyptian immigrant and cousin of Mr. Nosair, he was accused of being Mr. Nosair's "eyes and ears on the outside" after he was imprisoned in the Kahane case. Sentence: 57 years.